File-oriented ("normal") mode lets you use wild-cards and/or file-lists to specify files to be managed by TLIB. Six selectable wild-card search modes control the interpretation of wild-card specifications. The specified files are displayed in a multi-selection list box, from which you select the files for any TLIB operation. Or click the "Mode" button to switch from normal (file-oriented) mode into compiler-native project mode. Compiler-native project mode lets you “open” your compiler's native project file in TLIB, avoiding the need to use wild-card specifications or file-lists. Just click the "Mode" button to switch between compiler-native project mode and normal (file-oriented) mode. 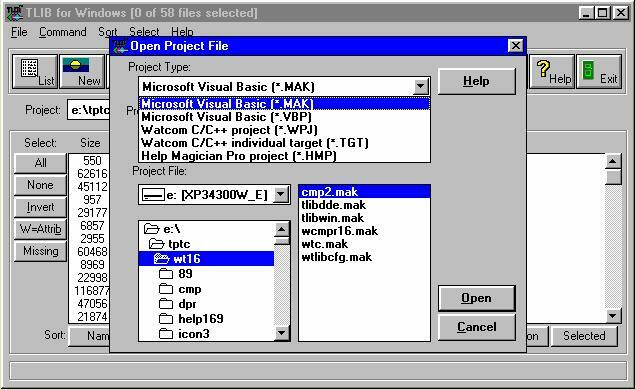 TLIB currently supports the compiler-native project files of MS Visual Basic 3.0-5.0, Watcom C/C++, Borland Delphi, MS Developer Studio 5.0 (VC++/VJ++/etc. ), Symantec Visual Cafe, the MultiEdit editor, the Codewright editor, and Help Magician Pro. Support for additional compilers and editors is planned. 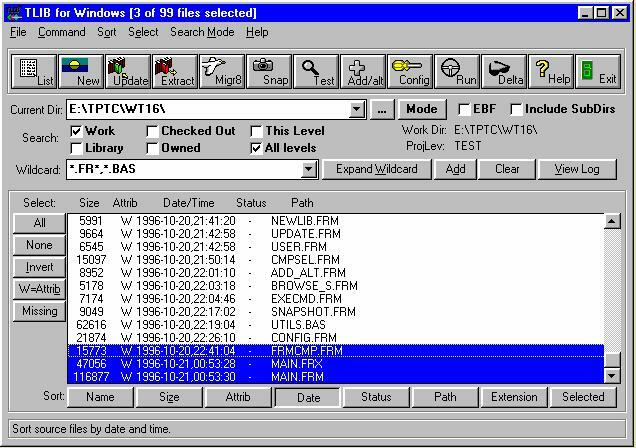 Note: the Visual Basic 4.0 Add-In is shown here. We currently have Add-Ins for MS Visual Basic 4.0, 5.0 and (in beta) VB 6.0, and also for MS Developer Studio 5.0 (VC++/VJ++/etc.). Other Add-Ins are planned, call or email for status. The Add-In for Visual Basic 5.0 works with VB 5.0 Learning Edition, Professional Edition, and Enterprise Edition. The TLIB Add-In for Microsoft Developer Studio 5.0 creates a dockable TLIB toolbar in the IDE. 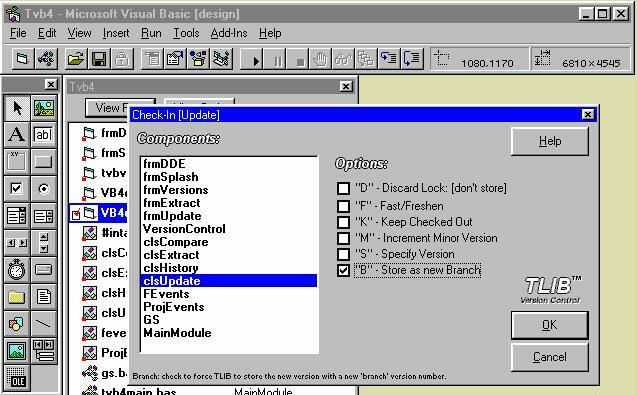 The TLIB Version Control Add-Ins for Visual Basic 4.0 and 5.0 integrate the most commonly-used TLIB commands seamlessly into the Visual Basic 32-bit IDE. To check-in (update) or check-out (extract) a source file, or to compare versions or view the revision history of a file, simply pick the appropriate menu item from within VB. Or, for less commonly-used functions, such as taking a "snapshot" version label of your project, just run TLIB for Windows in compiler-native project mode and open the VB project file. Version Control for Visual Basic programmers has never been easier!